FILE - Gyaltsen Norbu, the Chinese government-appointed 11th Panchen Lama, center, sits with fellow delegates before the closing ceremony of the Chinese People's Political Consultative Conference (CPPCC) at the Great Hall of the People in Beijing, March 13, 2015. A youth named by China as the second-highest figure in Tibetan Buddhism, but reviled as a fake by many Tibetans, on Wednesday told President Xi Jinping he backed national unity and would strive to meet the Communist Party's expectations. Tibet's current spiritual leader, the Dalai Lama, had announced his own choice of a six-year-old boy, but he was taken away by authorities and has since vanished from public view. This year marks not only the 20th anniversary of the boy's disappearance, but also the 80th birthday of the Dalai Lama, who has lived in exile in India since fleeing Tibet in 1959 following an abortive uprising against Chinese rule. It is also the 50th anniversary of the founding of what China calls the Tibet Autonomous Region. At a meeting in the party's Zhongnanhai leadership compound in central Beijing, China's Panchen Lama told Xi he would "resolutely uphold the unity of the motherland and its people," state television said in its main evening news bulletin. He would "not fail to live up to the ardent expectations of the party and people", the report added. Xi said the party paid great attention to events in Tibet, and would send a delegation to mark 50 years of the founding of the autonomous region. "Tomorrow will be even better for all the people of Tibet," Xi said, adding that he hoped China's Panchen Lama would promote patriotism and uphold national unity. 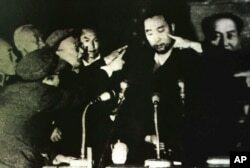 FILE - Tibet's 10th Panchen Lama is seen undergoing a Cultural Revolution struggle session in Tibet's capital Lhasa, in this 1964 photo. Chinese troops marched into Tibet in 1950. After the Dalai Lama fled, the 10th Panchen Lama stayed on and was initially seen as a collaborator, but it later emerged that his criticism of Beijing had earned him more than a decade spent either in prison or under house arrest.